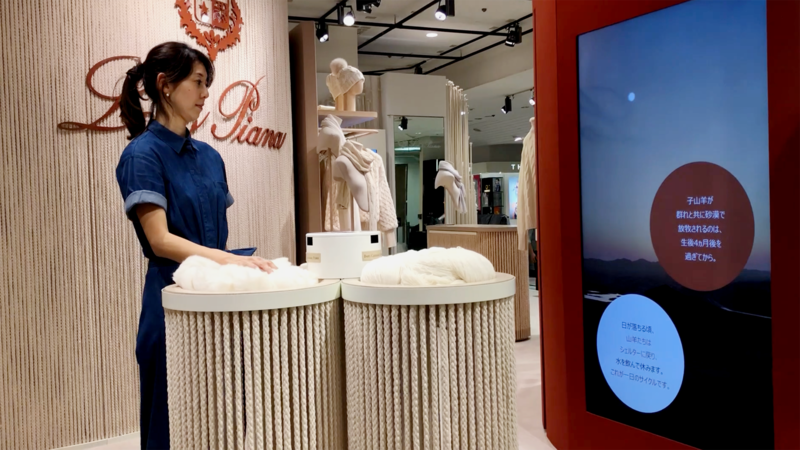 For the launch of new articles of clothing, we have supported Loro Piana and YARO Studio in the development of functional components for an interactive installation targeting asian countries. We advised and created the technical side of the project to make this experience possible, ensuring a stable and operational setup. The installation consists in a infrared Sensor Box and three tactile bowls filled with cashmere wool designed by YARO Studio. The users can experience different contents by passing their hand in front of the infrared sensors: when the user touches the wool, the content on the screen reacts and changes, showcasing the production chain of the brand. The Loro Piana and YARO studio concept has been made real through dimensioned CAD drawings, 3D modeling processes and several prototyping phases that allowed the Sensor Box to be engineered, hosting the sensors and electronics components. Our goal was to obtain a ready to use system of wired components, allowing Loro Piana staff to autonomously manage the setup of the experience in few easy steps and making it perfectly operative in every location. Through designing and prototyping of the hardware system we designed and developed a stable architecture that helped us reaching this goal, creating a ‘plug and play’ custom box hosting the full installation technologies.